Official images courtesy of Nintendo UK! Thanks to our new friends at Nintendo UK, we are pleased to be able to announce the launch of a brand new adventure, featuring our favorite Italian plumbers. Continuing the “Year of Luigi”, Nintendo has announced that Mario and Luigi: Dream Team Bros. for Nintendo 3DS will be released on July 12th. Make a date with the famous brothers in a new adventure – from the mysterious Pi’illo Island to the deepest recesses of Luigi’s dreams! With great success in countless quests down the years, it’s as if the powerful pairing of Mario and Luigi can defeat enemies in their sleep. 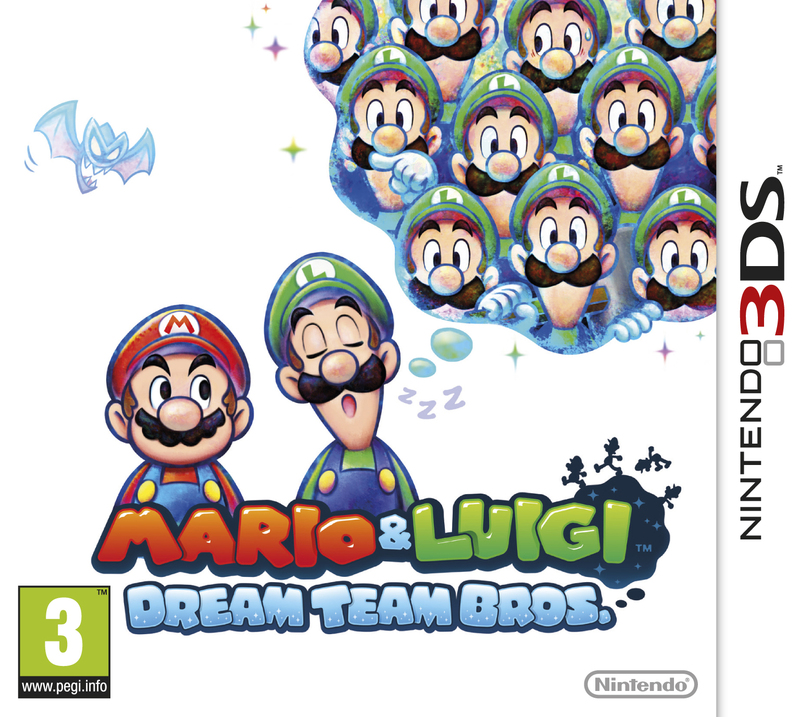 In Mario & Luigi: Dream Team Bros., released on 12th July for the Nintendo 3DS family of consoles, the brothers put such a theory to the test in a new adventure set on both an island near the realm of the Mushroom Kingdom, and within the depths of Luigi’s own dreams! In this fourth instalment of the popular RPG series Mario & Luigi, the story opens with Princess Peach and her staff, plus brothers Mario and Luigi in tow, being invited for a sightseeing trip to the mysterious Pi’illo Island by its equally mysterious proprietor, Dr Snoozemore. But after an initially hospitable welcoming to the island – albeit with Dr Snoozemore noticeably absent – things take a turn for the worse when Princess Peach is kidnapped and pulled into a Dream World by a new enemy in the series, the ghostly bat king Antasma. To chase down this new foe and rescue Princess Peach, Mario must enter this Dream World through the dreams of a sleeping Luigi, whose brain is revealed to be on a wavelength with the population of Pi’illo Island, the Pi’illo Folk. Alternating between Luigi’s Dream World and the real world, Mario and Luigi must solve puzzles, battle enemies, and even interact with creations of Luigi’s own imagination in order to succeed! The relationship between the real world and Dream World plays a critical role within the game. While roaming the Pi’illo Island environment in the real world, Mario and Luigi need to combine equally to use trademark Bros. Moves, while in the Dream World, it is the power of Dreamy Luigi that is all-important in supporting Mario. For example, Luiginary Works are magical ways in which the player can interact with the Dream World environment through Luigi’s sleeping form. Whether it is tweaking Luigi’s moustache or scratching his nose on the bottom screen of the console, this interaction provokes a reaction in the Dream World, affecting the environment to the benefit of Mario. In the Dream World battle sequences, the power of Dreamy Luigi once again comes to the fore when a horde of Luigis power up Mario to create formidable Luiginary Attacks, moves which greatly differ from the trademark Bros. Attacks in the real world, and which make use of the capabilities of the Nintendo 3DS or Nintendo 3DS XL consoles in original ways. As an example, one Luiginary Attack comprises Mario riding on top of a ball of Luigis, with the player using the motion controls of the console to navigate the ball’s course to crush the enemies that lie ahead. Whether attacking, counterattacking or dodging in battle, the 3D capabilities of the console are also critical for players to judge perfectly timed actions. When a battle is won, the levelling-up mechanic in-game follows a classic RPG formula, with experience points earned, improving common attributes such as health points and power, plus the addition of classic franchise attributes such as Bro Points – needed to perform special attacks – and STACHE – influencing the chance of Mario or Luigi scoring a critical hit in battle – remaining in this latest instalment in the Mario & Luigi series. Also following previous games in the series is a badge reward system, whereby both brothers can find or buy badges in-game that can be combined to earn the brothers useful rewards after certain actions – such as performing ‘excellent’ attacks – are carried out in battle. For those new to the series meanwhile, hint messages, an easy mode and a slow attack mode will help players get to grips with the battle sequences. Uncover the power of Dreamy Luigi in the latest adventure in the Mario & Luigi series when Mario & Luigi: Dream Team Bros. comes to the Nintendo 3DS family of consoles on 12th July. More details will be revealed about the Mario game on Nintendo of Europe’s official Facebook and Twitter channels – as listed below – at a later date, so stay tuned.